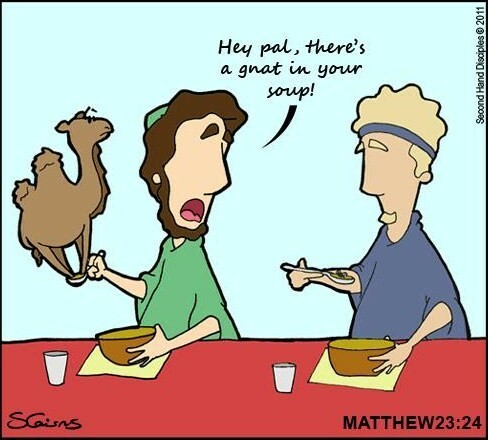 In Matthew 23.24, Jesus in His gentle and tactful manner tells the Pharisees “Ye blind guides, which strain at a gnat, and swallow a camel”. The Pharisees would get upset and vitriolic at the most minor of things, but fail to see how areas of their lives and ministries were hugely out of whack with God’s heart and love. The fact is there are still people out there today. As I express the Biblical truths about healing, people will come at you and say “That sounds Christian Science-y” – of course these will be people who have never met a Christian Scientist, never read Ellen White, and don’t actually know what Christian Science is all about. But someone told them this, they think it sounds wise so they strain at the gnat in your teaching. Someone else might say “That sounds like Greek philosophy”, or the power of Words doesn’t work because I can’t confess I am married to a supermodel and have it happen tomorrow (the fact that doesn’t work is because their spirit has never been wired with faith for that to happen, but your spirit is wired for faith in healing and prosperity – the problem is the mind has been programmed for failure!). They are straining at gnats, but missed the camel. Here is the camel: Jesus told us that we should do greater works than Him (John 14.12). He told believers (not apostles or pastors or super-doopers, but believers – all Christians) to lay hands on the sick and they would recover (Mark 16.17). The camel in the room is that Jesus Christ has given every single believer a healing ministry. Hebrews 6.1-2 tells us laying hands on people is a FOUNDATIONAL and BASIC doctrine – the milk of the Word. If you are not seeing the sick healed in your life and in your ministry. If you don’t have some testimonies of people being healed because you laid hands on them and prayed in Jesus’ name, then you have a massive camel in your dinner. You do not have time to find someone who is healing the sick and tell them that they haven’t dotted their theological i’s and crossed their philosophical and ministerial t’s correctly. You have a far, far bigger problem: you are failing to help sick people the Biblical way and failing to go around doing good by healing all those oppressed by the devil. You are failing to imitate Christ in one of the major areas of His life and ministry. You are failing to help captives of the devil get set free. You need to get on your face before God and ask Him for the wisdom to start seeing the sick healed in your life. You need to dismantle some of your poor theology and thinking that leads to doubt and unbelief; you need to destroy the traditions that make the Word of God (that when sent healed the sick) of no effect. You really don’t have time to go around correcting everyone else’s gnats until you sort out this massive camel. If the church took this advice seriously, it would revolutionize our witness on planet earth. Firstly, there was a backlash of persecution from cessationist Christians. Not from the world, not really – much more from Christians who denied the Scriptures and the power of God. This persecution took the form of exclusion from meetings, people were forced to stand down from leadership positions. Some pastors were removed from their churches, other pastors virtually expelled their entire churches for speaking in tongues and laying hands on the sick and seeing them healed. This caused a few people to back off and stop their new life of faith and miracles and joy. However, far more people were galvanised by this and it caused them to dig into the Word to understand the Biblical basis for seeing miracles and the gifts of the Holy Spirit. It caused them to spend much more time with the Holy Spirit as their comforter and friend, and the wave of miracles grew more intense. In the places where the persecution was strongest, often involving creative miracles of limbs re-growing and organs being restored. The second thing that happened is that some people who had been involved in the most religious, non-charismatic churches realized that the grace and power of the Holy Spirit was free and completely by the grace of the Lord Jesus. At the same time, many of the people moving in the gifts were very young Christians, some only being Christians for a few weeks or even days. Some of these people started – or continued – in some of the vilest sins. Some of these started to be exposed and revealed. It threatened to derail the revival spreading through London and at this stage had started to affect churches in the home counties and in some areas in north England, Wales, France and eastern Europe. Just at this time, several Christian ministers started to preach on purity and integrity in a powerful way. Thousands flocked to hear sermons on holiness and purity throughout London. People started to learn how to think on what is right, how to form pure and wise relationships and how to be honest in all their dealings. It was a beautiful move and it dovetailed into the healing wave that had just past. People started to learn how to live their life on the Word, not just on their gifting or anointing. A small group went into an excess and said they could live how they like and started swapping partners, but this group stopped almost as soon as it started. I have referred to this wave as a wave of financial integrity because that is how I saw it. All the things I described above happened in my vision, but the crest of the wave was this: churches started to deal with money in an open and honest way. I saw Christian leaders weeping before their churches because they had operated the church finances as an extension of their own bank accounts. I saw elders apologize for manipulating people into giving to their causes. Some people were repenting of making up causes to raise offerings and this was revealed. Now, I know for a fact that there is excesses like this inside the charismatic church, but what surprised me when I saw this happen was that it was as much the traditional churches that had leaders repenting and making restitution as the charismatic churches. Several pastors had raised money for an orphanage that did not even exist, and they were getting right with God and returning double the money to everyone who had given. It was wonderful to watch. And as it happened, as people – especially leaders – were honest, were owning up – there was a new level of trust across the body of Christ. A Pentecostal minister would admit his folly, and instead of shooting him down, the local Anglican church would love him and reach out to him and restore him. The Baptists were praying for the Assemblies of God, and the URC were praying for the Elim, and this opened up a number of joint meetings which led to many people being saved, healed and delivered. The irony was that when this was dealt with, people actually became more generous with their money. People who had never given more than a token amount to the church were giving 30-40% of their income into offerings for their churches. Money was being distributed to the poor in London like never before. A number of churches were getting together in different localities and buying buildings to use as shelters for the homeless and as soup kitchens, and places where people could be cared for and supported. In many areas, one church was organising the whole project but would be amazed when other churches in the area would just send huge offerings with no strings attached. As this wave started to subside – and I don’t mean that the integrity had ended, any more than the healings and miracles had ceased at this stage, but rather that this as a focus was ending – there were so many Christians who were fellowshipping with people they never thought they would fellowship with. This is when the third wave I saw hit. We are growing praise the Lord – growing in depth and growing in the numbers of people we are impacting. Last Sunday we had a lady baptized in the Holy Spirit and start speaking in tongues – she was healed in the week as well, praise the Lord. Next Sunday we are having a pastor and his wife come and join us who run a church in Tooting and the director of the FGBMI of London-East is also coming. We are overwhelmed by the love and support people are showing us at the moment.